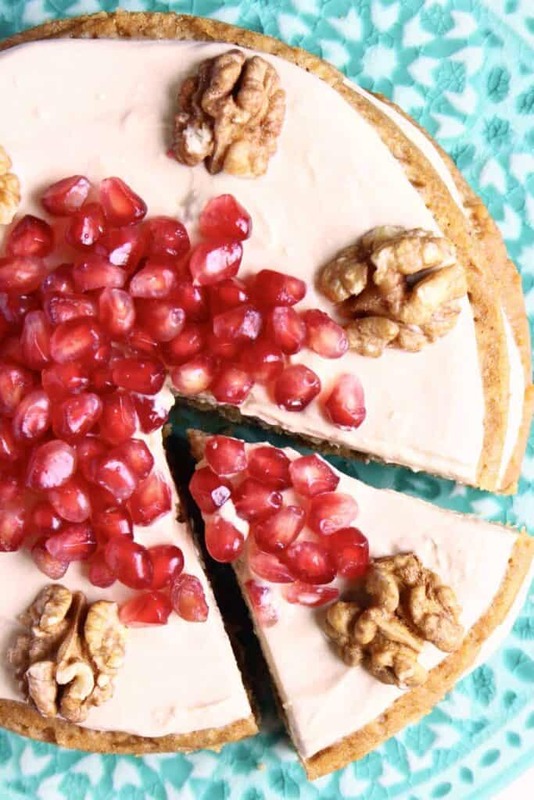 Coffee and walnut cake has always been one of my favourites, so I got thinking about creating a vegan, gluten-free and refined sugar free version that would taste just as delicious as the real thing! 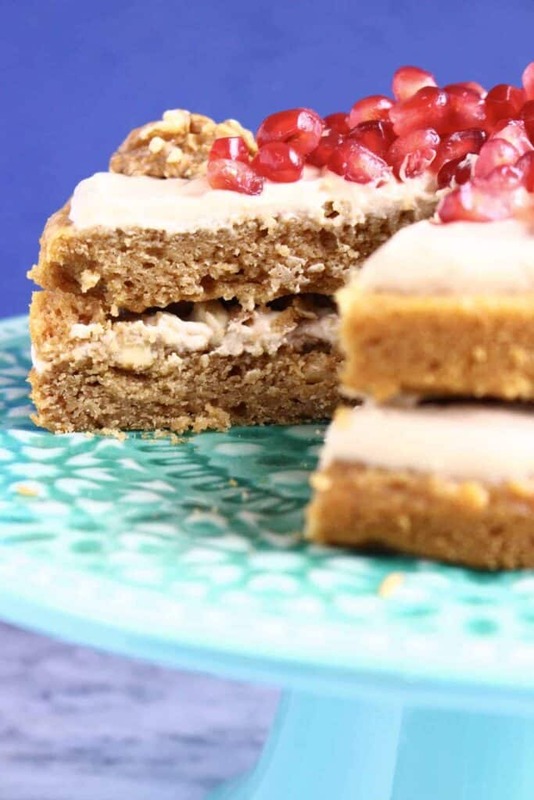 I used my favourite vegan, gluten-free and refined sugar free sponge as a base for this layer cake – I love its taste and texture, and what’s more, it requires just one bowl and uses easily accessible ingredients. 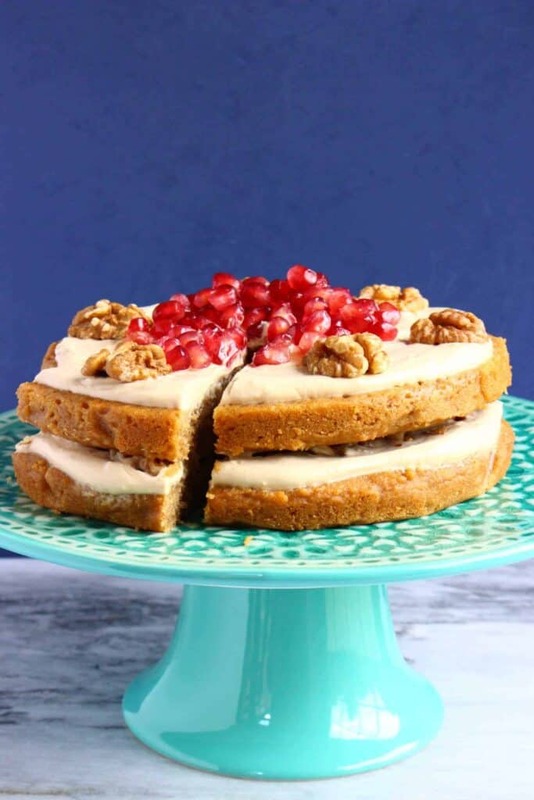 The coconut oil gives the sponge a rich, buttery flavour whilst ground almonds add a nutty sweetness and fluffiness. 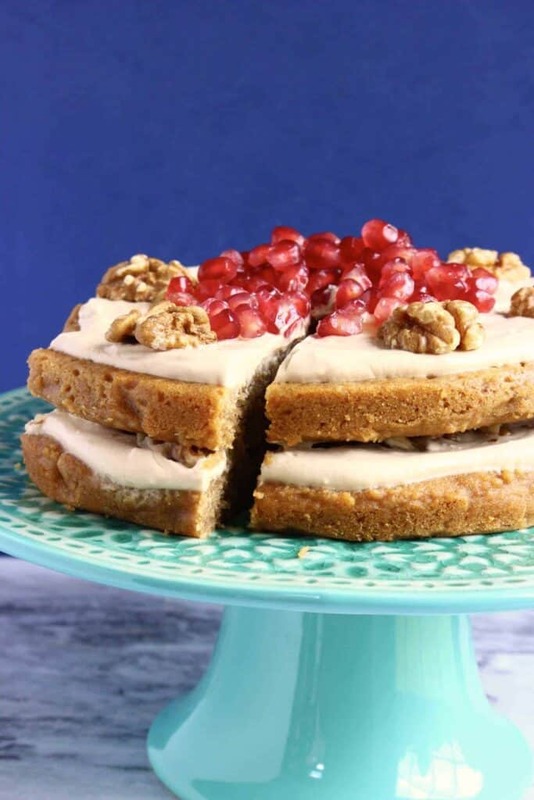 I don’t think it’s super traditional to use cream cheese frosting for a coffee and walnut cake (I think buttercream is more commonly used) but I just can’t get enough of a good cream cheese frosting, so decided to extend my love for it to this coffee cake. It’s so simple to make vegan cream cheese at home – just mix some coconut cream or coconut yogurt with a little lemon juice, which brings out a tartness perfectly reminiscent of cream cheese. Obviously you will have to add some coffee flavour to the sponge and the frosting. I try to stay away from coffee, so I actually used chicory powder. Chicory powder is made from ground chicory root and has a bitter, coffee-like flavour, so much so that it used to be known as ‘poor man’s coffee’. Chicory also boasts lots of health benefits, which include a supposedly reduced risk of diabetes, as well as digestive benefits. Ever since adding pistachios, mango and coconut to carrot cake, I’ve been all about adding interesting flavours to traditional cakes. 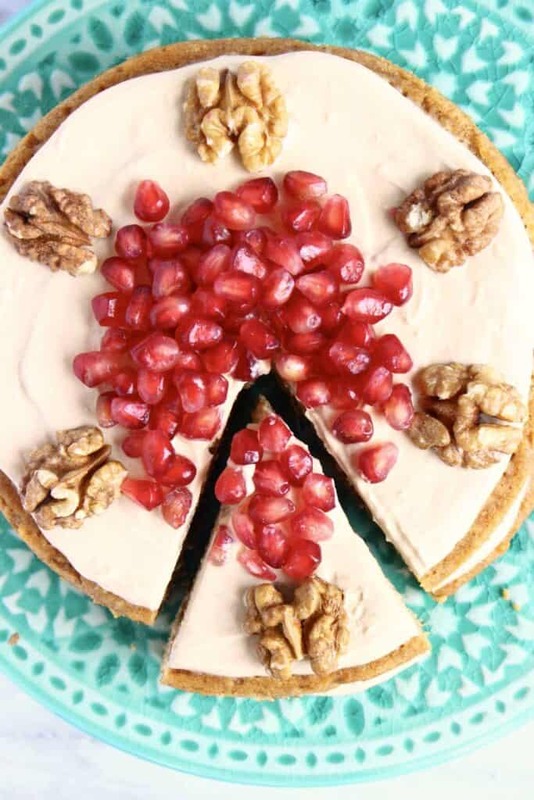 So I decided to add some pomegranate arills to this Gluten-Free Vegan Coffee Walnut Cake. They add a lovely pop of colour as well as a nectar-like sweetness and perfumey aroma that perfectly compliments the butter, earthy tones of the coffee and walnut. This cake looks and sounds delicious. My mum and I both love coffee walnut cake I am trying to eat gluten free and mostly dairyfree due to health issues. My mum is diabetic so I’ve been looking for a cake which is refined sugar free for a treat for her. I usually reduce or substitute any sugar in recipes although I’m not too great in the kitchen! I wanted to ask would this freeze well and for how long? Thinking if I made two I could freeze one. Or maybe I could make one cake but as small cupcake style cakes and just put frosting on the top and freeze a few, if so how would you adjust cooking time? Hi Rose, thank you so much for your comment. I’m sorry to hear about your health issues. 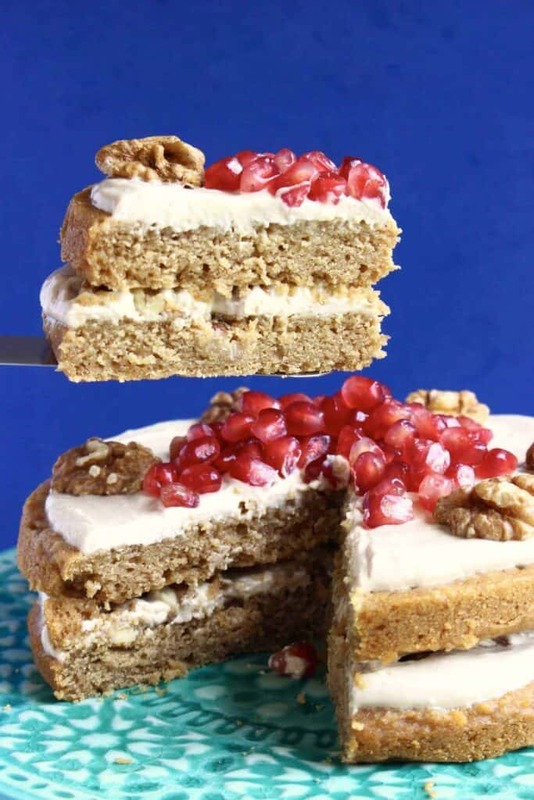 This cake would probably be ok to freeze for about a month – the sponge part can be frozen but the frosting will have to be made fresh when eating. Cupcakes would be ok, the cooking time would be between 15-20 minutes, until an inserted skewer comes out clean. Hope that helps and please let me know if you have any other questions! Literally just made your Coffee and Walnut cake. 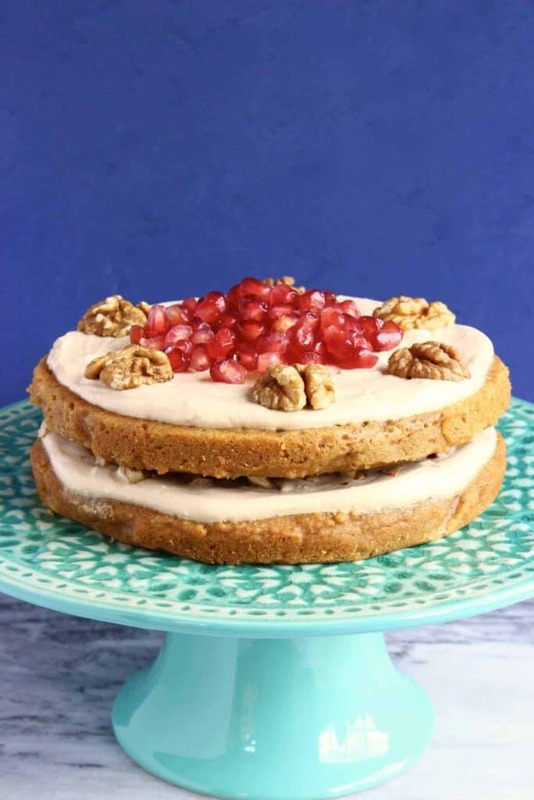 A slight adaptation as I used 50g ground Walnuts, 25g pecan nuts and 75g Ground Almonds rather than all Almonds)…and I just made a standard vegan buttercream (vegan Marge, icing sugar and instant coffee dissolved in warm water…but by golly it’s AMAAAZING! 🙌 Soo light and moist; certainly my favourite Gluten Free Vegan Cake so far. Thank you so much for making it and so glad you liked it!! Thank you for sharing your substitutions too, that’s so helpful to know! Thanks again. I’m just wondering how is use real brewef coffee in this recipe instead of instant coffee/chicory. Hello, yes that should work! I would halve the amount of milk and use 100ml quite strong coffee. Hope that helps! This sponge came out much more delicate and hasn’t held together as well as the Victoria sponge, do you think it’s because I used regular oil instead of coconut oil? Despite that it’s still amazing! So light and fluffy. I used vegan coffee buttercream for the filling and the top but I don’t think it needs it on top and in the centre as it’s very sweet. Next time I’ll just glue the bits together with the cream and leave the top! I’m working my way through your cake recipes! Yummy. Thank you for your recipes they’re the best I’ve found so far! Hi, thank you so much for making it and for your detailed feedback! I’m glad you like my recipes. I don’t think using regular oil in place of coconut oil should affect the structure that much – what gluten-free flour did you use? If it’s having trouble holding together adding a tablespoon of tapioca flour will help bind it. Hope that helps and thanks again!